Sony has launched its new high power portable home audio system in India. Called the MHC-V77D, the audio system is priced at Rs. 45,990. 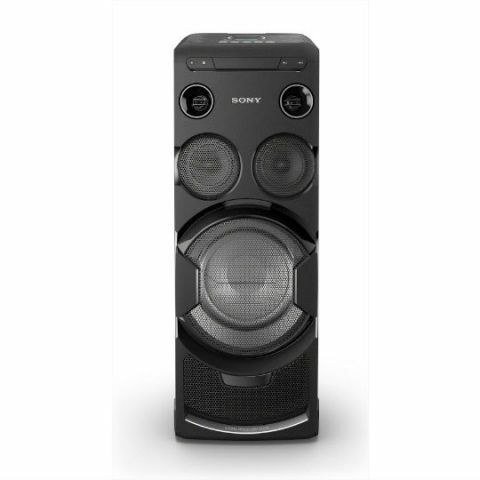 The Sony MHC-V77D supports Bluetooth and offers an audio output of 1440W with the company’s Digital Sound Enhancement Engine (DSEE) technology. It also comes with dual-lights, gesture and motion control and built in Google Cast. Extending its premium audio line up, Sony India today launched the new high power portable and stylish home audio system- MHC-V77D. There has been a growing demand for portable audio products and Sony has been continuously launching attractive audio products in this segment. An upgrade to the previously introduced GT4D and V44D, the MHC-V77D stands out for its impactful audio output, unique design sensibilities and premium technology. As a powerful wireless audio device, it guarantees to produce impressive audio output capability with 1440W. With its taller and bolder look, the MHC-V77D is a one box solution producing detailed surround sound, clear vocals with thumping bass effect. With all this MHC-V77D becomes a perfect party companion. To enlighten any party’s ambience, these high powered speakers are ideal for EDM (electronic dance music) lovers. Adding to the overall tech capabilities the speakers also consist of Sony’s DSEE technology (Digital Sound Enhancement Engine) which up-scales any compressed music content & delivers rich studio quality audio experience. With this technology one can enhance even downloaded content quality to give rich audio experience and have a better audio quality. It also comes with the LDAC feature which enables the transmission of Hi Quality Audio, even over a Bluetooth connection. This in return offers better audio quality even on bluetooth transmission. Adding to the seamless experience, one can experiment with the customizable lighting features and varying sound effects to suit your style. MHC-V77D has compact 1 Box Design for maximum portability and yet space saving especially at living room. An apt combination of style and sound quality, the audio system has the light weight and space saving design. The wheels and handle bar make it easy to pack and move around, one can position it in the perfect spot to blast the Sound Pressure Horn. Space illuminating lighting in MHC-V77D beams multi-coloured light from the ceiling to the floor in time with the beat. The new twist comes in the form of a touch key and dedicated function themed lighting. The MHC-V77D's touch panel is splash proof, so one can keep the party going all night even in the case of a drink spill over. It is dust proof thereby making it easy to maintain and clean. The speaker ports are hidden with a cover and protect it from any possible damage. MHC-V77D is the first portable personal DJ System with a Touch Panel. To experience unique gesture control one can connect USB and witness the magic of MHC-V77D with simple gestures to witness volume up/down, play/ pause, song change. For motion control connect with NFC/BT and work with the feature through Song Pal –Fiestable. For an interesting musical ambience it is also capable of light control and DJ Effect. Improving connectivity features, this super speaker has multi-source playback with HDMI connection, Bluetooth® and NFC, for simple one-touch connectivity. On top of this, there’s audio in as well as CD/DVD, USB, 2 mic inputs and an FM tuner meaning that this speaker really does have it all. MHC-V77D has dual lights for any party and can get automatically synched to music beats. In low light illuminating speaker lights creates a perfect party ambiance and club like dance floor. Using the SongPal app one can select the effects such as the lighting directly from the smartphone. Adding to the unified experience, equipped with intuitive operations users can control the music via Wifi or Bluetooth, meaning one can browse music through online streaming. MHC-V77D has Google Cast built in, so you can cast your favourite music apps from your personal device to your speakers. It also has Spotify Connect, so one can use their premium Spotify subscription to enjoy their favourite party playlists in party-starting power. Additionally it also has a feature called party host which lets Connect multiple MHC units in a chain to produce a higher sound output, without any sound lag between systems. MHC-V77D will be available in all Sony Center and major electronic stores across India. To enjoy the Karaoke function, an additional mic F -V120 can also be purchased.